Forget the haters, the naysayers, the so-called statisticians: we know Kobe is clutch. 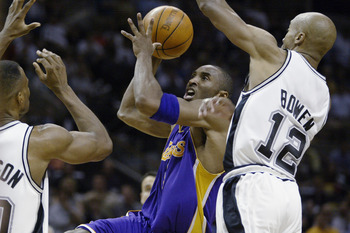 This image, from Game 4 of the 2002 semi-finals (a mere 5 years into his professional career), proves the cold-blooded, win-at-all-costs mentality that earned the future hall-of-famer the nickname “Black Mamba.” Kobe rises over renowned defender Bruce Bowen and Hall-of-Fame Center David Robinson (listed at 7’1”) not once, but twice, grabbing the offensive board, landing, and soaring again for the cradled floater to propel the Lakers to a playoff victory with four seconds left in the game. Ultimately, it does not matter whether Kobe is truly a clutch player by statistical standards. This image is from 2002 when advanced statistics are still being formulated, and the NBA community BELIEVES Kobe “Bean” Bryant is the best closer in the game. With that comes changed status based on the perception of traits associated with clutch play, garnering Kobe instant respect for his (supposed) courage, fearlessness, and leadership mentality. Within the culture of the National Basketball Association, there is a respect for largely immeasurable qualities, like clutch play, that give players an increased mobility within the social and professional hierarchy of the sport. While it’s easy to fall in love with a scoring champion or a finals victor, fans and players alike have an admiration for those individuals who “hustle”, or have “well-developed fundamentals”, or are “students of the game. ” For Kobe, his legend began with the recognition that when the buzzer is about to sound, Bryant makes baskets.